Tonight, Rayn was a satellite video guest on the live-aired video internet program, “Sunday Elevation,” presented by Vokle. She engaged in a live, 15 minute long interview with the show’s hosts, Orlando Dillon and Kirk! 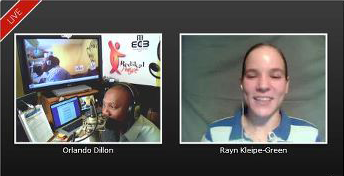 On November 6, 2011, Rayn was a phone-in guest on the live-aired video internet program, “Sunday Elevation,” presented by Vokle. She engaged in a live, half-hour long interview with the show’s hosts, Orlando Dillon and Kirk! Rayn was invited to return the following week via webcam!